Jake is the horse that has been living on the old St Nats school field. The scaffolding on the tower of St Nat's is now complete. Judging by the huge cement 'baths' at the side of the church I'm hopeful that restoration is on the cards of the landmark. Now thats a good natural interesting photo. God love Jake, he's gorgeous and he looks like quite a character! Yet another wonderful photo Andrew. Awwwwwhe is a lovely looking Clydie the chain is a bit of a worry though.....not a good thing to leave a horse chained in a field that is if he is.......cheers!!! Will you be climbing to the top of the tower on completion, Andrew? Fabulous photo of Jake he really compliments this beautiful church. The brickwork is superb, does anyone know if it's Accrington Brick? 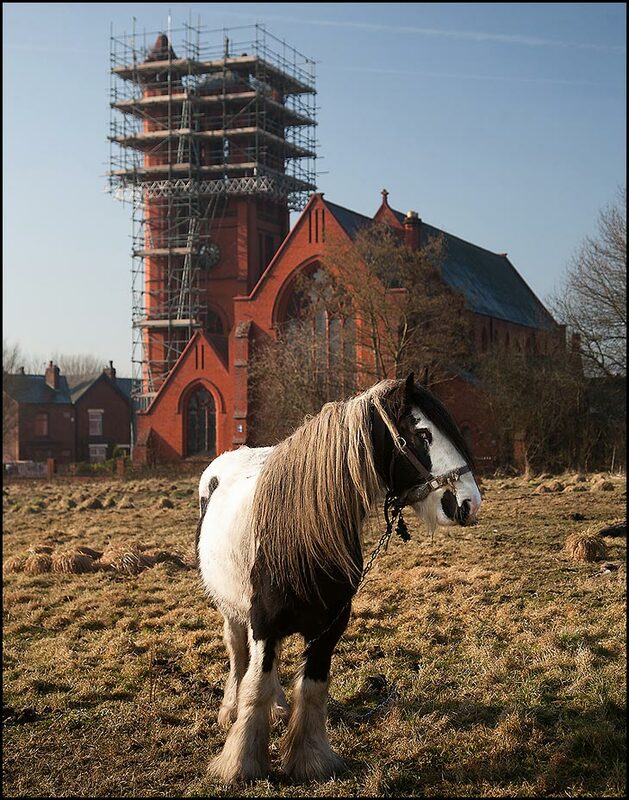 Very nice picture Andrew, the horse is showing his best side! Henry7, thank you, it certaily is Accrinton Brick. Ernest - great idea - i will see what i can do! Good to see the progress on repairing the tower to St Nats, which I attended during my formative years. Now living in Norfolk I don't get up as often as I would like and am pleased to see the tree removed. The horse is cute too. aww lovely , has anyone on here seen the horse and her foal on warrington rd spring view going toward platt bridge, there were about 20 horses on that field a while ago , i hope theire ok as people are feeding them they look like they need a good bath and brush and some shelter they are gipsy horses i think.